We are stockiest of CAF gaskets / Non Asbestos Gaskests which required for sealing between two flanges. CAF. CAF/Non Asbestos cut gasket seal is effected by yielding or flow of material into the imperfections of joint contact faces. In this way gasket provides an unbroken barrier of homogenous structure through which no pathway exist for escape of confined media. The resisting power of compressed fiber asbestos jointing also depends on type of fluid, temperature so selection of right quality of gasket is very important to suit the process the best. We are stockist of CAF/ Non asbestos & spiral joint gaskets for flanges. 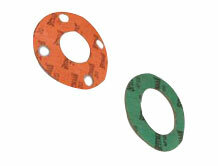 We can offer gaskets from are assortment of gaskets. Service : Water, steam and for some chemical high service conditions.